Mayor Arthur C. Harper happens to be in all sorts of trouble. He’s telling the newspapers that he has had enough of politics and won’t seek another term. The district attorney is trying to shut down the local red light district and eventually these efforts will reveal allegations of City Hall corruption involving Harper, Police Chief Kern, a police commissioner, a police captain named Broadwood and Nicholas D. “Nick” Oswald, one of the biggest leaders of the city’s underworld. The 1909 Broadwood case is complicated (he was found not guilty, by the way, despite accounts of payoffs from the earnings of Los Angeles bordellos) and in researching the mayor’s life, I came across the following incident. The word “homosexual” is a rarity in The Times, appearing exactly twice in editorial content between 1900 and 1940: a 1912 review of “The Candle and the Flame” by George Sylvester Viereck; and a 1939 health column by Dr. William Brady. 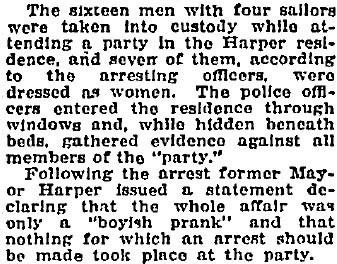 “Twenty Los Angeles men, some said to be prominent in social and business circles, were arrested last night by police at a stag party in the home of former Mayor Harper and were booked at the police station on the charge of social vagrancy. The men were taken to jail as they were dressed, meaning that some of them spent the night in women’s clothing. Early the next morning, The Times says, the dresses were taken into evidence, so some of the men were given bathrobes and others draped themselves with jail blankets. Of the 16 arrested, four were released to the Navy (they were in uniform, The Times said) and eight were held in custody because they tested positive “for infectious disease.” And yes, their names or pseudonyms, addresses and occupations were published. Police said that officers learned about the party several weeks ago. “Arrangements were made to have some of the officers in the house,” The Times said. 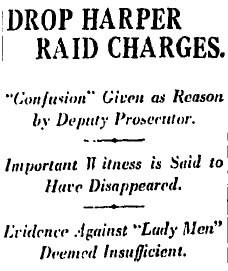 Two months later, the case against the “Lady Men” was dismissed. Bonus fact: One of the earliest occurrences of “gay bar” in The Times appears in a Oct. 15, 1953, story about the extortion trial of Jimmie Tarantino and refers to a bar on Market Street in San Francisco. This entry was posted in 1907, 1909, 1912, City Hall, Crime and Courts, Downtown, LAPD, Lesbian, Gay, Bisexual, Transgender and tagged 1920, City Hall, crime and courts, fashion, lapd, LGBTQ. Bookmark the permalink. Love old LA vice squad stories! “Lady men” are nothing new here. The LGBTQ community is, as you can imagine, poorly documented in the daily press, so I have to take stories wherever and whenever I find them. Laying under a strangers bed for TWO HOURS! Above and beyond the call of duty …apparently “duty” did not call. And no one has made a film of this? It’s really a bizarre story.